The downy woodpecker is one of the most common backyard birds in North America, but even this distinct woodpecker can occasionally be challenging to identify. 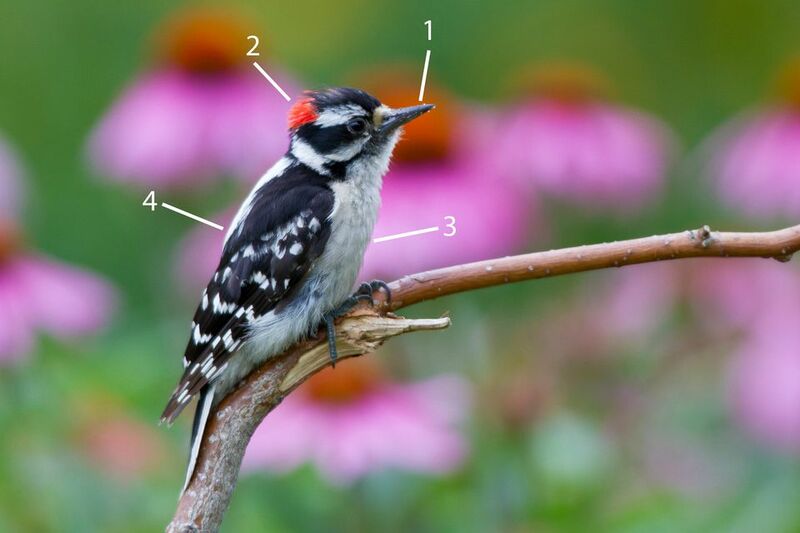 Understanding the key field marks for this bird can help backyard birders feel more confident about identifying woodpeckers of different species, and recognizing the downy woodpecker in all its ages, plumages and behaviors is easy with practice. Bill: Downy woodpeckers have a short, nub-like bill that is less than half the length of their head, and the base may be obscured by fluffy rictal bristles. Check the bird's profile to get the best estimate of bill length. Nape: The red nape is the clue to the bird's gender. The very back of the head will have a red patch, but that patch does not extend onto the crown. Female downy woodpeckers do not have the red patch. Underparts: The breast, abdomen and flanks of the downy woodpecker are a plain, clear white without any spotting or barring. Upperparts: The wings are black with white spotting that forms a series of lines along the length of the wing. The dark back has a prominent white patch in the center that can be easily seen on a foraging bird. Feet: The feet are gray-black with a zygodactyl configuration, with two toes pointing forward and two toes pointing backward. Depending on how the bird is perched, the toe orientation can be difficult to determine, but the color can be a good identification clue. Tail: The bird's tail is stiff and straight, acting as a brace for balancing while scaling tree trunks or branches. The end of the tail is slightly forked and there are faint black spots on the outer white feathers, though these can be difficult to see except at close range. Bill: The short, nubby bill is less than half the length of the head. The base has a fluff of rictal bristles, and the bill is often used for drumming or prying along the bark of a tree to seek out insects. Nape: The black nape of the female downy woodpecker is her identifying gender clue. Males have a red patch at the back of the head, but females are only black and white. Underparts: The underparts are plain, unmarked white without barring, streaks or color washes of any kind. Upperparts: The upperparts are mottled black and white, with a wide white patch in the center of the back. The wings may appear spotted and the white spots could give the impression of a series of wing bars, though the spots continue to the wingtip. Tail: The stiff tail has a slightly forked tip and shows small black spots on the outer tail feathers. Those spots can be difficult to see except at close range or if the tail is slightly flared. Wings: The broad wings are somewhat rounded and show a heavy pattern of black and white spotting even on the underside, with white spots arranged in regular rows across the primary and secondary feathers. Wingpit: The wingpit is plain white and appears relatively small in comparison to the overall size of the bird's wing. Head: Even in flight, the black and white streaks on a downy woodpecker's head are visible, though the nape may not be easily seen and so the gender may be harder to determine. Bill: The downy woodpecker's bill is so small that it may appear as little more than a bump or nub on a flying bird, giving the head a slightly pointed look at the front. If the bird has a much more prominent, noticeable bill, it is unlikely to be a downy woodpecker. Underparts: The white, unmarked underparts of the bird are clear and easily visible in flight. Tail: The bird's tail is held stiff in flight, and the underside of the tail is plain white. The small black spots on the outer tail feathers may or may not be visible if the tail is closed, but if it is flared they become easier to see. Crown: The crown of a male juvenile downy woodpecker has a red wash with gray or black flecks, but it will lose that color as it matures and the color comes out on the nape. Females will show less or no red, but still have the flecked crown. Bill and Food: The bill of a young woodpecker may seem much larger than on adult birds because the bird's head and body size are not yet mature, and its rictal bristles are not as developed. Adult birds often bring their offspring to suet feeders in late summer, and the young bird will seem clumsy and uncertain. Upperparts: The upperparts are black with grayish-white spotting and the back patch is often more gray than white on young birds. As they mature, the spots will lighten to give the greater contrast of adult plumage. Underparts: To better camouflage the young bird, the plain underparts are a pale or medium gray rather than white, and often appear ruffled or mussed, giving them an unkempt appearance as their feathers grow. With practice, birders can quickly become familiar and confident with downy woodpecker identification, leading the way to easier identification of a range of less common woodpecker species. Can You Identify the Common House Sparrow? Crow vs. Raven: Which Is Which? Which Nest Is Which? Identify Bird Nests With Ease!